NEW ORLEANS – A busy weekend in collegiate track & field resulted in some big-time performances. Here are 10 athletes who stood out from their peers and were named National Athletes of the Week on Tuesday by the U.S. Track & Field and Cross Country Coaches Association (USTFCCCA). Jordan Geist had to dial it in a little bit this past weekend at the Jim Click Shootout, but once he did, he went to the top of the national leaderboard in the shot put. The sophomore from Saxonburg, Pennsylvania, fouled on three of his first five attempts before unleashing a heave of 21.28m (69-9¾). That was an outdoor PR for Geist and topped Payton Otterdahl’s previous national-leading mark by more than one inch. This is the first time that both the Arizona program and Geist has earned a National Athlete of the Week honor during the outdoor season. Mackenzie Little is back in a familiar spot. Little, a senior from Sydney, Australia, bettered her national lead in the javelin to 59.47m (195-1), a mark she recorded this past weekend at “The Big Meet” between Stanford and California. She was strategic with her throws as she alternated between attempts and passes with a victory well in hand. If you counting at home, which we know you are, Little now has two marks in the all-time top-20 of the collegiate record book. This past weekend’s effort sits 20th in history among all throws by collegians. This is the second time this season that Little has been named National Athlete of the Week. Decio Andrade is the National Athlete of the Week after having one of the best throws of all-time in the hammer at the Angelo State David Noble Relays over the weekend. The freshman from Camacha, Portugal, had a best toss of 70.42m (231-1) which made him the sixth-best performer in the event in NCAA DII history. The mark also makes him the tenth-best performer in the event across all collegiate levels so far this outdoor season. Andrade is the fourth athlete in program history to get selected for a National Athlete of the Week honor during outdoors. Ellianne Kimes is the National Athlete of the Week after she had one of the best weekends of any pole vaulter in NCAA DII history. The sophomore cleared a best of 4.20m (13-9¼) to win the event at the Hilltopper Relays against a field of NCAA Division I athletes. The showing made her the seventh-best performer in the pole vault all-time in NCAA DII history. Kimes is the first athlete, male or female, in program history to win a National Athlete of the Week award during the outdoor season. There was going to be a new national leader in the 800 by the end of the fast heat at the Pomona-Pitzer Invitational. It was just a matter of who would take over the top spot. Would it be Carter Floyd? Or would it be Tucker Cargile. If you’re reading this, then you know Floyd got the edge. But what you might not know is that it was an incredible race to the finish line. Floyd broke the tape in 1:51.29, just .01 seconds ahead of Cargile’s 1:51.30. That put Floyd on top of the national list, which pairs nicely with his No. 2 billing in the 1500, a 3:49.09 effort he clocked way back on March 9. This is the first time that a male athlete from Pomona-Pitzer has been named National Athlete of the Week during the outdoor season. Maya Weigel earned the honor twice in 2016. Name one of the only women at the NCAA Division III level to be ranked in the top-5 of four different individual events. Give up? Her name is Favor Ezewuzie and she’s a junior at Wheaton (Ill.). Ezewuzie, who already owned a top-5 national mark in the 100H going into this weekend, added three more to her ledger at the Wheaton Invitational. She is now also ranked No. 3 in the open 100 at a wind-legal 12.13, No. 5 in the 200 at 24.94 and No. 5 in the long jump at 5.66m (18-7). 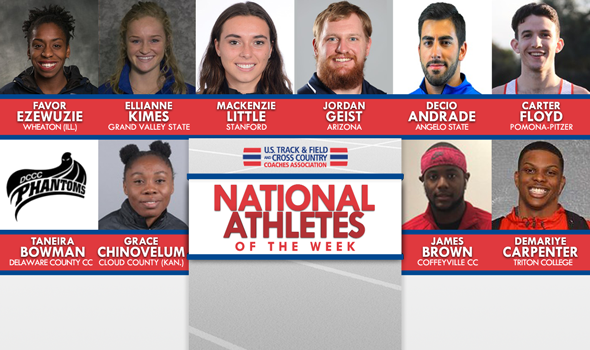 This is the first time that an athlete from Wheaton (Ill.) has been named National Athlete of the Week during the outdoor season. On a weekend that featured Barton County (Kan.)’s Alencar Pereira posting the No. 1, No. 2 and No. 3 throws off all-time in NJCAA history in the hammer, James Brown arguably stood out even more as he won the long jump at the SBU Invite against a talented field. The freshman soared 7.81m (25-7½) on his top attempt, which leads the NJCAA and puts him 11th on the all-collegiate list this season. He also placed third in the 100 and ran a leg of the team’s 4×400 relay that finished fifth. Brown is just the second athlete overall (and first male) to win the National Athlete of the Week honor in program history. Grace Chinovelum was named National Athlete of the Week after posting top marks in two jump events this past weekend at the Friends University Spring Open. The freshman became the sixth-best performer in NJCAA history with a 13.17m (43-2½) effort in the triple jump and also posted the seventh-best mark in the long jump so far this season as she won both events at the meet. Chinovelum is the first athlete in program history to get selected for a National Athlete of the Week honor during outdoors. Demariye Carpenter got the nod for National Athlete of the Week after posting quick times at the Wheaton Invitational. The sophomore won both the 100 and 200 with times of 10.79 and 21.77, respectively. The marks made him No. 1 in the 100 and No. 2 overall in the 200 so far this outdoor season at the NJCAA DIII level. Both marks were also personal bests. Carpenter is the first athlete in Triton College history to be selected as National Athlete of the Week. Taneira Bowman is a National Athlete of the Week honoree after a busy weekend at the Towson Invitational. The freshman posted the No. 1 mark at the NJCAA DIII level in both the 100 (13.10) and the long jump (5.28m/17-4), while also having the third-best time in the 200 (26.88). Just for good measure, she also finished 10th at the meet in the long jump against a field that included NCAA DI athletes. It is the second week in a row that Bowman has won a National Athlete of the Week award.